Tire rotation is an extremely important component of car and truck maintenance. Rotating tires ensures that all four tires wear down evenly. There are many reasons why this is important. Tires that wear down unevenly may affect the way the vehicle handles and be dangerous in off-road conditions. They may also affect the alignment of the car and they will need to be replaced at different times which can be a hassle and cost more money. Tires that wear evenly will consistently provide a smooth ride for the driver and will keep the car well-aligned. They will also be able to be replace as a set which ensures less time at the automotive shop along with lower costs. Rotating tires is necessary because front tires and rear tires wear differently. This is especially true in many trucks because the load is balanced towards the front. Front tires often wear down much more quickly than back tires, and this can mean that front tires will go out in as much as half the time as the back tires. This means that a car or truck that does not rotate its tires will often have front tires that are more worn than their back tires and this can be dangerous. If the tires are properly rotated regularly the wear difference between the front tires and back tires will not be significant. Tire rotation only refers to switching back tires with front tires. It does not refer to the process of swapping left and right tires. 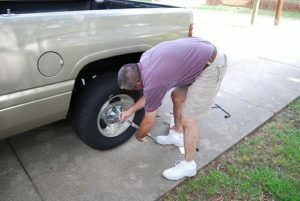 Rotating a truck’s tires is usually an extremely fast and inexpensive process. Many shops can complete a truck tire rotation within an hour and will do a tire rotation as a standard maintenance process. Any mechanic shop should be able to quickly rotate tires. Those with small trucks and cars can sometimes rotate their tires themselves but it is a very labor intensive process and will usually take an evening to complete. Large trucks are generally too heavy to have their tires rotated at home because it requires jacking up the vehicle repeatedly. Drivers can determine whether they need to rotate their car’s tires by inspecting the tread on the front and back wheels. If there is a significant difference between the wear of the tread on front and back wheels then it is likely time to rotate the tires. If the tread seems about even the driver can usually put off the rotation.